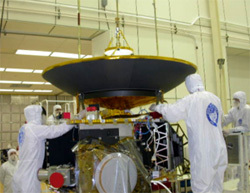 April was a memorable month for the New Horizons spacecraft team, for it saw the completion of spacecraft assembly and the accomplishment of a thorough Comprehensive Performance Test (CPT) that put the spacecraft and its seven instruments through rigorous functional testing. On the last day of April, we began the first of the major flight mission simulations. This will be followed by another CPT run lasting through mid-May, and then the beginning of environmental testing. At the end of May, NASA Headquarters will conduct a review of mission readiness for the planned January 2006 Jupiter-Pluto launch window. Now that we are moving into the testing phase, I thought it would be worth taking a few minutes to step back to the earliest days of the project and recount the insider story of how New Horizons got its name. 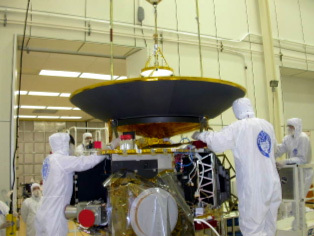 As you might know, in late December 2000, NASA unexpectedly announced it would solicit competitive proposals to design and construct a Pluto-Kuiper Belt (PKB) mission spacecraft. Within two weeks of that announcement, half a dozen university-industry teams formed to compete for PKB. Our team consisted of the Southwest Research Institute (SwRI), the Johns Hopkins University Applied Physics Lab (APL), Stanford University, Ball Aerospace and just over 20 science team co-investigators. As the project leader and principal investigator (PI), it was one of my responsibilities to honcho the selection of a name. I wanted us to choose a name that was both descriptive and inspiring — after all, this was to be a historic mission set to explore a whole new realm of the solar system. I soon found out, however, that it wasn't as easy as you might think to settle on a good name. In fact, it ended up taking many weeks, with over three dozen separate suggestions evaluated. It's kind of like naming a baby: you have to choose a name that you'll be willing to enjoy using for many years, and all kinds of people want to give suggestions and opinions. My first reaction, of course, like everyone else's, was to find a suitable acronym. After all, that's just what you reflexively do in the space business. But if you are looking for acronyms to name a Pluto-Kuiper Belt mission, you quickly find they all end up being words with a lot of Ps and Ks in them, representing the mission's targets, and lots of Es for "exploration" or Ms for "mission." Acronym suggestions began to roll in within a few hours of the call for ideas: COPE, DOPE, ELOPE, NOPE, POPE, PUSS, PIMPLE, PLATITUDE, PIP, and PORE (and a couple of others I won't mention in mixed company) all had suitably descriptive names when spelled out, but were wholly unacceptable as acronyms. Despite many efforts and many, many scrabble-scribbled pieces of paper, we never came up with an acronym I could get excited about for PKB. A typical example was APEX, for Augmented PKB EXploration — which made an overly oblique reference to a slogan I coined in the early 1990s about Pluto exploration, that "it is the Everest of planetary exploration." PEAK was a similar attempt, which felt equally uninspired. And there was FARR, in honor of APL's recently successful NEAR mission to nearby asteroid Eros and symbolizing the contrast of a mission going to the edge of the solar system. But FARR, while kind of fun, clearly had too much attitude in its acronym (Finally a Return to Reconnaissance) to be acceptable. One of our competitor teams revealed they would be called POSSE, for Pluto Outer Solar System Explorer. I could see from this and my own repeated, unsatisfactory attempts, that inspiration would require something that the restriction to dry, descriptive aerospace acronyms has not delivered.